As per an analysis by Transparency Market Research (TMR) the global walnut market has a competitive and fragmented vendor landscape. Key players such as Alpine Pacific Nut, Guerra Nut Shelling Company, Grower Direct Nut Co. Inc, Poindexter Nut Company, and Andersen Shelling Inc are operating in the global walnut market. In order to stand alone in this competition, the key players are focusing on offering product quality. 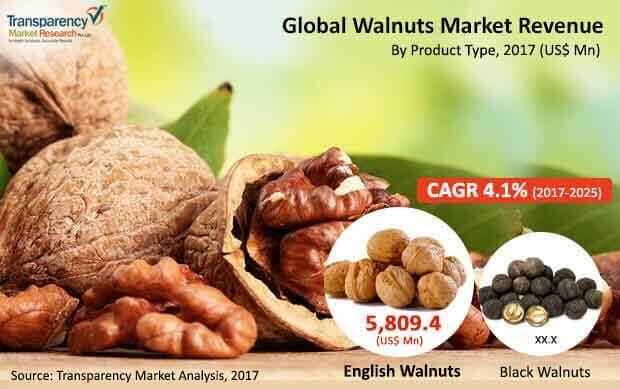 According to the report by TMR, the walnut market is projected to reach a value of US$8534.5 mn by 2025-end from the value of US$6197.1 mn in 2017. The market is expected to expand with a CAGR of 4.1% over the forecast period from 2017 to 2025. By category, the shelled walnuts segment is expected to be the most attractive segment in the forecast period. Based on product type, the English walnuts is expected to occupy the largest market share of 93.7% in 2017. By region, the market in Asia Pacific and Europe is expected to dominate over the forecast period followed by the Middle East & Africa. development. With evolving ways of life, numerous individuals are introducing solid propensities that fundamentally incorporate utilization of supplement rich sustenance’s, for example, walnuts. Inferable from an ascent in such wellness cracks, the interest for these things is expanding, in this way making the global walnut market develop at a consistent pace. Far reaching extensions happening at last use ventures inferable from mushrooming prerequisite of the walnuts is driving the market as well. What's more, a rising interest for comfort sustenance, imaginative and appealing bundling, and rising populace with a high discretionary cash flow to spend on premium dry organic product items is boosting development in the global walnut market as well. Regardless of the above portrayed development inciting factors, poor vertical combination among walnut makers is eminently preventing the global walnut market. This isn't just being seen as for the administration of the makers, yet in addition is noted as far as creation limit. Such fair vertical reconciliation has additionally made numerous merchants sell walnut items at costly costs, in this way making it troublesome for those having less discretionary cash flow to get them. Ultimately, a deficiency of walnuts and trouble in transportation of the products to remote and immature locales also is limiting the global walnut market significantly. By and by, numerous organizations are quick to present quality and more affordable items in future, therefore counterbalancing the restrictions influencing the market.